Do you sometimes wonder if your life is going in the right direction? Do you feel as though within you is the burning desire to do something much bigger than anything you’ve ever done before but the “reality” of everyday life is stopping you? Are you still unsure of your life’s purpose? Or perhaps you don’t know your life’s purpose, but you do know that whatever you’re doing now isn’t what you were put on this planet to do forever? The reason that I say this is because if you can in fact relate to these thoughts, it is likely that you do not understand the numerological meaning behind your life and as a result you are constantly trying to swim against the tide rather than with it. This is the reason why your life is always in a state of conflict. Perhaps deep within you, is the desire to do something beyond anything you’ve ever done before or have even dared to dream of doing. It keeps manifesting itself which is why you feel “trapped” in the rut of feeling like you’re missing out on something better. Well the truth is that the numbers surrounding your birth date, otherwise known as your Life Path Numbers, have an immense impact on the role that you are destined to take in life. Think about how this could change your life. Instead of wondering why you feel like you should be doing something else, you can clearly identify what your soul wants and then begin taking the path which will bring you joy and fulfillment. And that’s exactly the reason that I decided to create a system that can equip you to discover the meaning behind the numbers of your life, using none other than the power of hypnotic influence. 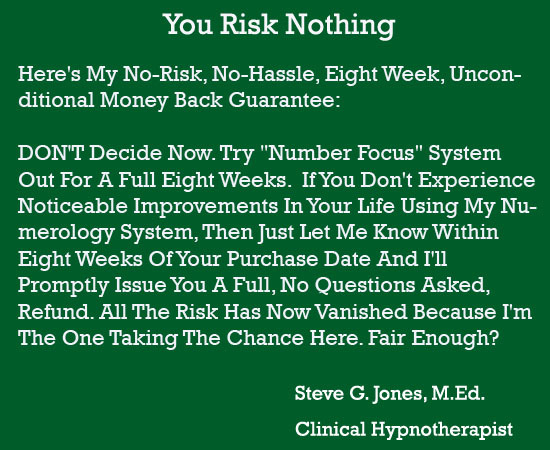 Introducing Number Focus by Dr. Steve G. Jones, M.Ed. If you are ready to fully understand the path of your life instead of living in a state of conflict and confusion wondering what role you are supposed to take on, then you need to take action right now and own this system. who you are supposed to be. 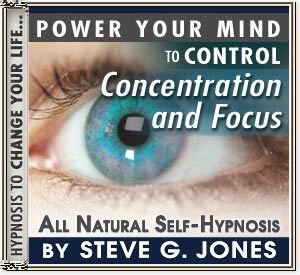 Enjoy better concentration and focus with this new self-hypnosis MP3!